"creativity", "home", "inspiration", "musings", "stash", "tips and tutorials"
So much is being said about Marie Kondo and her Konmari method these days. Haven’t heard of it? It is a decluttering/home organization philosophy. What makes it different from most - at least as far I see it from reading the book and doing my own clean up efforts - is the breakdown into categories of items, as opposed to by room, and the whole notion of sparking joy. She says you shouldn’t keep an item unless it sparks joy. It isn’t really about getting rid of all your stuff and living as a minimalist, but about keeping what truly makes you happy. We are sewers and quilters, arguably everything we have for creating sparks joy - eventually. That being said, the amount of stuff many of us accumulate in the pursuit of a joyful hobby can indeed be overwhelming. That applies whether you have a dedicated room (s) in your house for sewing or a corner of the bedroom. It is easy enough to say to put your stash on a bookshelf or store projects in the bins under the bed, but like the Konmari method espouses, it is worth asking yourself whether it is worth keeping. Breakdown your stuff into categories. Say goodbye to things that no longer hold your attention or appeal to your current taste. Embrace the space you have and work with its limitations. Let’s talk categories first. Under Konmari our sewing supplies would fall under one broad category called Komono. It is a really broad category. For sewing supplies we are giving them their own categories. These are the ones I recommend and some tips for sorting/purging. Stash Fabric - go through every bin/shelf, stack, pile. Remove what you don’t like anymore, even if you think you might use it one day. Chances are there will be another purple fabric you will buy down the line. Trim any dangly bits. Fold or refold. Go with what works for your own storage, just be consistent in how you do it. Also, do it in a way that makes sense to you. If you don’t you will not maintain the system. Scraps - I am a firm believer in storing scraps by colour, with some discretion for size. Then again, I did write a whole book on just that (with Amanda Jean Nyberg - Sunday Morning Quilts). If you’ve never sorted your scraps just doing this can open up potential. 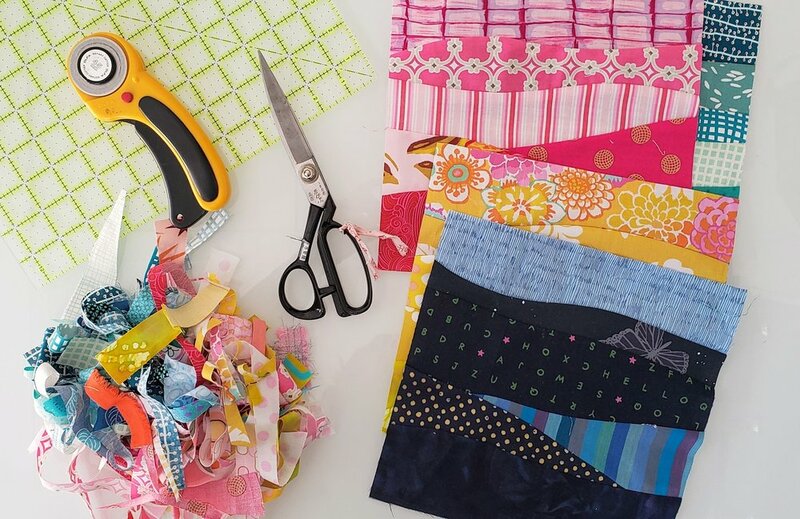 If you’ve always sorted scraps and never used them, consider passing them along. Thread - Sort by fiber content and use. For example, I have some poly/cottons or poly for garment sewing and all my cotton for all my quilting work. I may have a pretty rack that shows them by colour, but that is only for my all cottons. And my Valdani and thick ones for hand stitching are all together as well. Notions - As a quilter I don’t have much this way myself, but garment sewers are likely to have zippers, buttons, bias tape, and much more. Or applique quilters might have a collection os fusibles. Whatever it is, bring it all together. Bought a big role of Wonder Under and used it once? Pass it on, you can always buy more if you start a different project. Some of these lose their viability too. I like zipper pouches for smaller notions grouped together and a drawer in my cutting table for rolls of paper and such. Tools (including machines) - Rulers, oh the rulers! And the templates and the sewing machine feet, and 4 rotary cutters. Unless you are a minimalist or beginner you probably have far more than you need in this department. Look at them all together and pick out the top 3 rulers you use. The rest you can probably pass along. Same for rotary cutters and scissors. One for daily use and maybe a travel/back up set. Sewing machines and their accessories are expensive. Personally, I have 3 machines. That is really 2 too many. One will do the job. But I will keep them all - one I use when I travel/teach and the other is technically my mom’s. Ask if the collection all gives you joy and decide for yourself. Patterns and Books - Even I, the improv quilter, have a collection of patterns and books to rival most. I love my books so much, and the built in bookshelf my husband made me. Go through and decide if they are something you have or will ever pull down again, otherwise donate them to the guild library. As for patterns, let it go! Made it once already and loved it, fine, but will you make it again? Think you might make it? Is that going to be this year or ‘sometime’? If the latter, let it go. As for storing, I suggest finding a drawer or bin or bankers box that will hold them all together. No more looking for a lost pattern. And those PDF sewing patterns you printed? Roll them up and put them in poster tubes or even paper towel rolls. Quilts Under Construction - This is the time to really ask the question about whether the project sparks joy. Every few months when I visit my list I ask myself the question. Sure, there are a mountain of projects on the list, but I am keen to get my hands on all that stay on the list. The rest I have passed on to guild members or repurposed the fabrics. It’s totally okay to admit you don’t love the fabric, the process, the project anymore. Free yourself from that creative baggage. Finished Quilts - I realize that not everyone has a stack of quilts to worry about. Being in this game for as long as I have (20 years!) the stack of finished quilts has really grown. So many have sentimental value or are gifts for my immediate family. Many are ones I made for publications in books or magazines. All get used at some point - whether on a bed/couch or in a trunk show. But the time comes when the racks are full and I need to say goodbye. It is purely a sentimental decision at this point, but I do have a stack for giving away. Friends and family first then some charity donations. Our sewing supplies hold the potential for joy more than the joy itself. That is completely valid. No one, even a Konmari expert (of which I am not) is telling you to get rid of all your stuff, to buy only for the project at hand. (Although I saw a thread on Reddit that said exactly this!) All of this is about getting a handle on what you have and being able to access it - as well as the joy it can bring in the process of sewing - easily. While I have a dedicated sewing space now for the longest time I did not. Taking over the dining room table, kitchen counter, and any spot of storage in an old house was how I built my quilting career. And the second, the absolute second I was given any more space I filled it. Sewing supplies are like any liquid - they will fill the available container. If you find your stuff overflowing what you have then it is a good time to empty the glass and start over, before you are flooded entirely. What about the things you decide you don’t want or need anymore? What are you supposed to do with them? Unless it is the tiniest of scraps (which I often leave out for the birds and squirrels) you can donate or sell most of what you are getting rid of. Try your own destash sale on line or have a quilting garage sale. Join forces with a friend or two to make it even bigger. Look to local charities for donations or larger organizations like Victoria Quilts, Quilts of Valour, or Project Linus. Always check with each organization first to see what they want or need. Have a supply swap at guild. Give it away to someone who is interested. Donate to a Home Ec program. Ask around online for beginner or low income quilters to share your wealth. Whatever you do, don’t get hung on how much you paid for it originally. If you goal is to clean up your supplies and keep what gives you joy then your goal is also to get rid of what doesn’t help in that matter. Besides, you aren’t throwing it in the garbage, you are finding it a new home with someone who will likely find joy in it. A friend recently sent me this article on minimalism and creativity. It is me to a T. Is it you? Ultimately, I believe that clutter is the killer of creativity. I realize that some folks love the piles and the messy desk and will claim that kind of space their favourite. To each their own. But I am a firm believer in empty spaces providing opportunity. It is why I don’t have an inspiration wall, why I store my fabric behind closet doors and not on open shelves, why I like bins and baskets contained, and why I like large furniture wherever possible over small carts and shelves standing next to each other. When we have space to create, space to breathe, then we have the space for creativity to blossom. Don’t think of Konmari in the sewing room as a tragic event, that you are saying goodbye to creativity along with your stuff. Hanging on to a million things that you might use isn’t feeding your creativity at all. It’s actually weighing you down, maybe even causing you stress. Why do you think people are always shocked when I talk about my Quilts Under Construction list, it stresses people out entirely. And when we are heavy creativity has no room to breathe, there is no space for the imagination to soar. At the heart of Marie Kondo’s message is that we should only keep what sparks joy. Ultimately, it is your space, your sewing. Do whatever works for you, what brings you joy.